Pairs with Stone Cottage Cellars Pinot Noir. Born of a family-wide love of ravioli and an overabundance of acorn squash, this delicious pairing goes wonderfully with our Pinot Noir. The sweetness of our Alpine Dessert wine (used in the sauce) pairs nicely with the natural sweetness of home-grown squash to bring out warm, earthly flavors, complimented with a touch of rosemary. Our go-to recipe for holidays and special events, this dish is in season all year round. In a large saucepan over medium heat, sauté shallot in olive oil until fragrant and golden brown. Add squash, Dessert Wine, salt, and brown sugar. Reduce heat and simmer for 10-15 minutes. Combine water and flour. Roll out onto a floured surface. Fold, and roll again, repeating until dough is smooth. Roll to 1/4 inch thickness. Using a small inverted drinking class, cut 2- or 3- inch circles out of the dough. Spoon squash mixture onto half of each circle. Fold circle in half and seal tightly with a fork. Boil ravioli for 4-6 minutes in 3 quarts of water, or until all ravioli float. In a large saucepan, heat butter until melted. Add sallot, garlic, and rosemary. Sauté 2-5 minutes, or until shallots are translucent. Add cream cheese mixture and Dessert Wine. Bring to a boil, then reduce heat and simmer for 15-20 minutes. Salt and pepper to taste. 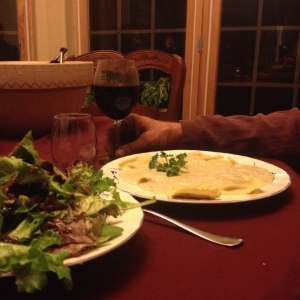 To serve, arrange ravioli on plates and cover with sauce. Garnish with a sprig of fresh rosemary or parsley and serve with Stone Cottage Cellars Pinot Noir.